I bought a two pairs of LSG02 red glasses for use with my 1 watt 445nm blue laser and they arrived in about 16 days. The glasses look quite a lot different than what's in the picture. 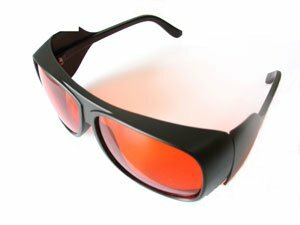 (more like the typical sports sunglasses, only with dark a red tint). They come with detachable ear supports so that you can attach the included head strap to keep them on your face. Each pair also comes with a cleaning cloth and a very nice zipper case. The glasses work fairly well, blocking out the bright blue light of my 1 watt blue laser making the laser dot very dim yellow. I do not have a laser power meter to measure how much light is blocked by the glasses (in case of a direct hit) but they have worked great for just blocking out all the dangerous scattered light from the dot. (When you start getting up into class 3b and class 4 lasers, it can become dangerous to look directly at the dot at close range without eye protection). Overall, I would say dragon laser's safety glasses are the best eye protection to buy if you can't afford nice $50 glasses and just need something that works. The safety glasses are comfortable and do the job of reducing the laser light to a safe level. I'm VERY happy with my purchase. The laser safety glasses perform very well. The product was well packaged and has good quality. These glasses really work well. Been playing with a 650 and 660 nm 800 mW burning laser for a custom foam cutting system. I only notice the tiny focused dot and not the very bright (and dangerous) rings around it. Do not skimp on your eye safety. Get some quality goggles like these. Very good Safety glasses. i get 3 of the LSG02 for my violett, green and new 1W Blue Laser. all the dots are clearly visible as a yellow dot. Unfortunately I do not have a laserpower measuring device like a laserbee, but the rest of light when shining the lasers through the glasses on the wall is tiny. This is the first time I purchase a laser pointer from Dragon Lasers. The quality is outstanding to be honest. The Spartan has a very powerful 200mW green beam. Certainly does the job for pointing out stars in the night sky. Fast shipping and great customer service as well! Definitely recommend it. I bought these to use with the Spartan 90 mw red laser that I bought at the same time. When wearing these glasses, if there was visible red coming from my laser, I couldn't see it. After taking glasses off for a second, the Spartan red was brilliant. Glasses 100 percent effective. High quality. Works super when working with an open IR DPSS laser. Tested with a camera before use and fully blocks IR light. Neat design (even nicer model now then on the picture). Also fast shipping and great customer service.